Iran is blessed with a variety of ethnic groups, cultures, and dialects each accompanied with special costumes and lifestyle. Such fragmentation has sometimes pitched various ethnicities against each other. People living in various regions sometimes think their ethnic identity is something different from their national identity. People of Azarbaijan, for example, consider themselves to be Turks rather than Persians and are very sensitive to all kind of jokes, gests or any other thing which may question originality of their culture and language one way or another. That sensitive has been also reflected in their films and books. That is, if a Turk character does something improper or is depicted in an unsuitable way in a film or series, they will protest to having been misrepresented! Perhaps, it will be quite funny for a European or an American citizen to know about such prejudices, which are also extended into occupations and various guilds. If a nurse, for example, is cast as a villain, all nurses will protest to it and if a baker is depicted in an unsuitable way, bakers are sure to raise Cain. The latest instance of such illogical prejudices was in Hassan Fathi’s new TV series, Along Zayandeh Roud. The series had been shot in Isfahan and a number of characters spoke local dialect of Isfahan. Before the series was midway through, there were bitter protests form people of Isfahan who believed that their dialect had been spoken sarcastically. Meanwhile, most actors were not natives of Isfahan and were only doing their part. Later on, some state officials joined the protests and even Isfahan’s deputy at the Iranian parliament objected to distorted use of Isfahan dialect and moral depravities of some characters. Interestingly enough, they urged that the series should be stopped and were not content with legal protests. 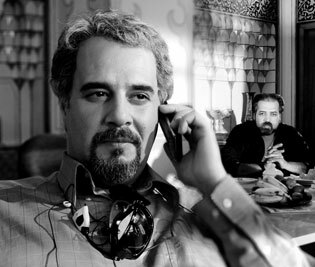 Although the series continued to the end, pressures from people of Isfahan forced TV officials to delete some scenes to prevent more trouble. This is a common event in the Iranian cinema, which makes directors make their films in Tehran. There is also a degree of risk accompanying casting various professions which may elicit similar protests from people engaged in that profession! It is not clear who is the next victim and till when such an illogical protests are going to be order of the day.